When Marquis Wellesley became Governor-General of Calcutta in 1798, he decided that the existing Government House was not a suitable building for his position and needs. Charles Wyatt's design for the building was based on Paine's design for Kedleston Hall in Derbyshire. This source was reflected in use of four wings projecting from a central block. 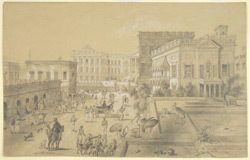 The northern façade of the new Government House in Calcutta, shown here, has a portico with a large staircase under which carriages drove to the entrance. Wellesley Place connected the new Government House with Tank Square.